I am so happy that the day is finally here to share the cover with everyone for the book Life After Dark. This book contains stories from 100 survivors of suicide loss and attempt from across Canada. These people are my heroes and after ready their stories of hope, I think they will be yours too. The story behind the cover. 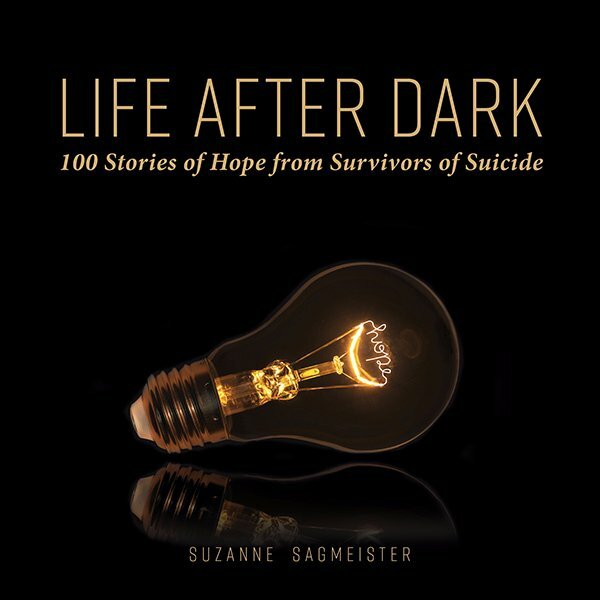 When I began to visualize the book that would hold the stories from survivors of suicide, I thought I knew exactly what I wanted on the cover; a lightbulb, standing straight and strong, with the word hope glowing in the filament. The lightbulb holds substantial meaning to me and has played a role in this project since its inception. When I drove across Canada in 2015 to complete the vision of having survivors from every province and territory within the pages, I had a date chosen when I would leave Western Canada, a date selected when I would end in Newfoundland and a date in which I would get my 10th tattoo, a lightbulb standing straight with, you guessed it, the word hopeglowing in its filament. In addition, when writing the song HOPE with Tenille, the line that held the most significance to me was (Have you ever) thought you turned off the last light? This is because at one point in my life, I thought I had turned off my own last light. This is also why, at the beginning of the music video for HOPE, you see me walk in and turn ON the light. My deep belief is that we all have the power to turn the light back on in our own lives and then, by sharing our stories of overcoming, we light the path to resiliency and overcoming for others. The title Life After Dark represents exactly this. Before I even handed in my manuscript to the publishing company, I stated unequivocally the vision for the cover and, when it came time to begin design, I was sent multiple examples for the key element, the lightbulb. I began to go through each one of them, anticipating I would find ‘the one’ which best represented the ideal I had suggested. When I came upon the third image, instead of it being the straight standing lightbulb that I had been so clear on, it was a lightbulb laying over on its side. Pfft. Well that’s not straight and strong, I thought to myself and quickly continued to look at the other samples, each which had its own strengths. Oddly, something inside of me drew me back to that fallen down lightbulb and as I stared at it, taking in its shape and luminosity, I understood why. When I first began this project, I was strong; mentally, physically and spiritually with a fervent intent to turn my pain into purpose and help others. Although I was prepared for some hurdles along the way, I could not have anticipated just what life had in store for me including, the devastating death of my son’s father to suicide. From that point on it seemed like an ominous cloud was following me and the decidedly continuous onslaught of trials, pain and loss took its toll until ultimately, I found myself at the hospital with thoughts of suicide that had burrowed their way into my mind, refusing to leave. I desperately wanted the pain to stop. I had felt shame, guilt, anguish, fear and self loathing. Once I started to get better, I had doubts about what I had been doing; interviewing survivors and giving speaking presentations on hope. How could I possibly be believable now? How could my story hold any impact when I had once again succumbed to a severe depression? Digging my way out of that dark place took a whole lot of grit and a healthy dose of grace. Through the process I realized that I had the power, through transparency and vulnerability to make this one of the greatest chapters in my book of life. As I continued to study this lightbulb laying over on its side, still glowing, it became abundantly clear that this was the image for the cover. Although it had fallen, it nevertheless shone with hope and just like we sometimes fall, we too could still have hope. It was a precise metaphor and furthermore, when I looked more closely, I saw the lightbulb’s reflection – perfectly representing our ability to shine a light into another’s life. That was afterall, what this entire vision had been all about, showing others that there is life after the dark times in life. And so, I introduce you to the cover of the book that will hold not only the stories and photograph of survivors of suicide within the pages, but also your support and belief in helping to create a converstion that matters. I hope that it has as much significance to you as it does to me. As I grew as a woman through the process, the book grew with me. Originally planned to embrace the life changing stories and photographs of 100 people from across Canada, it now also contains my own story and the journey to the completion of the book. I have included intimate excerpts from my diary, vivid stories from the road, thoughts I shared on social media, songs that were especially meaningful to me at the time, as well as texts and emails I received. Collectively, these take you from the day I became inspired to begin this journey through to the day almost three and a half years later when I sent in my manuscript. They are shared with the hope that they are like the backstairs into my life―a front row seat to this startlingly beautiful journey. Thank you for sharing your support with me and believing in this project. The people I have met through this journey have proven to be the greatest gift I have ever received and I feel immense gratitude for that.